I deal with elderly patients. Is there a hip joint model you would recommend? A basic hip model and an arthritic hip model are both good choices for working with geriatric patients. The basic hip model clearly shows the top of the femur as well as the hip joint, greater and lesser trochanter, ischial spine, ischium and pubis bones as well as the ilium. This provides an extremely accurate and simple perspective on the hip, ideal for discussing fractures, bone chips, deep muscle bruises and other conditions associated with falls. The arthritic hip joint model is not made to be life sized. It actually shows four separate stages of arthritis in the hip joint. Even though each of the four representations is smaller than the basic hip they are very clear in showing the advancement or progression of arthritis in the joint. Erosion, bone spurs, fractures and degenerative joint disease are all displayed on the series of models. This can be instrumental in talking to elderly patients and their families about the aging process and what treatment options are available. What is the difference between a basic hip joint model and a muscled hip joint model? Both the basic hip joint model and the muscled hip joint are the same physical size with regards to height and width. The actual model of the muscled hip has additional features that include the gluteus medius, gluteus minimus, iliacus, inferior and superior gemellus, obturator internus, piriformis and psoas muscles. 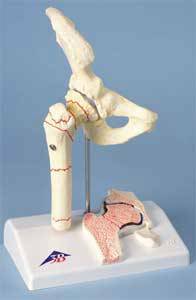 In addition the articular capsule ligaments are also clearly shown on the model. This type of model is ideal for teaching, research, and also for patient consultation and discussion. Having both the basic model as well as the muscled model is highly recommended in any type of health care setting. The two models compliment each other and allow the medical professional to choose the degree of detail they require in the model when working the patient. What is the typical size of a hip joint model? The more accurate in size that a hip model is, the more effective it is in helping the patient or student to clearly visualize an actual human hip. The best option when choosing a model is to look for a full size normal hip, which is typically going to measure approximately five inches by four and three quarter inches in length and width. Depending on the specific type of mounting to the base the height will be about eight and one quarter inches to stay accurate in dimensions. Both the basic hip and the muscled hip will have the same dimensions for a model size and the both will include the top of the femur to show how the ball joint of the hip works. These smaller sized, compact models are good for emergency rooms, patient care rooms in orthopedic units and in the office of a family doctor and take up much less space than a complete skeletal model or a full leg model.